Today’s Defence coverage focuses on the military contribution to President Trump’s visit and the Defence Science and Technology Laboratory supporting the police investigation into the recent poisonings in Amesbury. 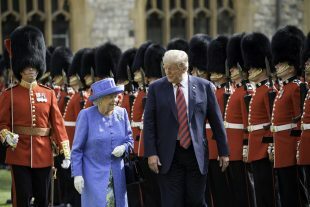 The BBC, Sky and ITV ran broadcast coverage of the Band of the Coldstream Guards and Band of Grenadier Guards who performed at Windsor Castle to welcome President Trump. Commentary explained that these troops are fully operational as well as ceremonial, and many are due to deploy to Iraq and the Falklands soon. The Times, the Glasgow Herald and the Sun all report on President Trump’s comments that he was ‘blown away’ by the joint US-UK Special Forces hostage rescue display. His comments that the UK-US relationship is ‘very, very strong’ are also carried. Broadcast and radio evening and breakfast news covers Dstl scientists finding Novichok in a container recovered by the police from Charlie Rowley’s house. This factual reporting was also carried by national and regional newspapers. “On Wednesday 11 July, a small bottle was recovered during searches of Charlie Rowley’s house in Amesbury. It was taken to the Defence, Science and Technology Laboratory (DSTL) at Porton Down, Wiltshire, for tests. Her Majesty The Queen and President Donald Trump inspect the Guard of Honour at Windsor Castle yesterday.